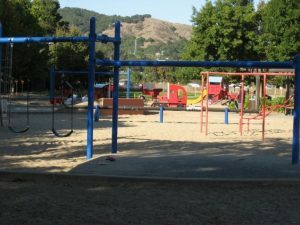 The City received a federal grant for the replacement of playground structures at Pickleweed Park. The project will remove the existing swings, slides, accessory structures, & sand which have been there for some 20 years and replace them with brand new structures & fill the play area with engineered wood fiber. We have conducted online surveys and had a public meeting at the Albert J. Boro Community Center to allow the community to choose what type of structures they would prefer. Some 20 residents, including many children, filled the room at our public meeting held on February 6th, which was also attended by Council Member Kate Colin. The residents were excited to see what we had in mind for the new playground structures. Figure 2 shows a 3D rendering of a possible configuration for one of the play areas.